it seems that this is my 100th post! i'd like to celebrate by sharing one of my creations, this little recycled wool nest and egg. 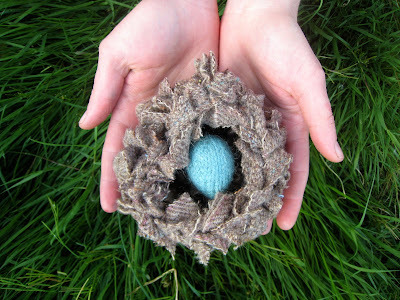 (woolly egg pattern here.) thank you to everyone who stops by this space to share inspiration and support. i am so grateful for the connection and positive perspective in my life. for the gift, please leave a comment, and i will select a random number monday evening and plan to post tuesday with the recipient. if you like, share something you are grateful for this day! love to you! congrats, marie! the powers that be (aka random number generator) selected you! let me know where to send your gift! blessings!